When the final goal post was erected in Kimberley, South Africa in early 2015 it signaled the completion of one of the most ambitious public interest programs in the world to use sport as a catalyst for social change. The Football For Hope movement was established in 2005 as a collaboration between international governing body FIFA and street football world, a global NGO that uses the planet’s favorite sport to lift up under-resourced communities. 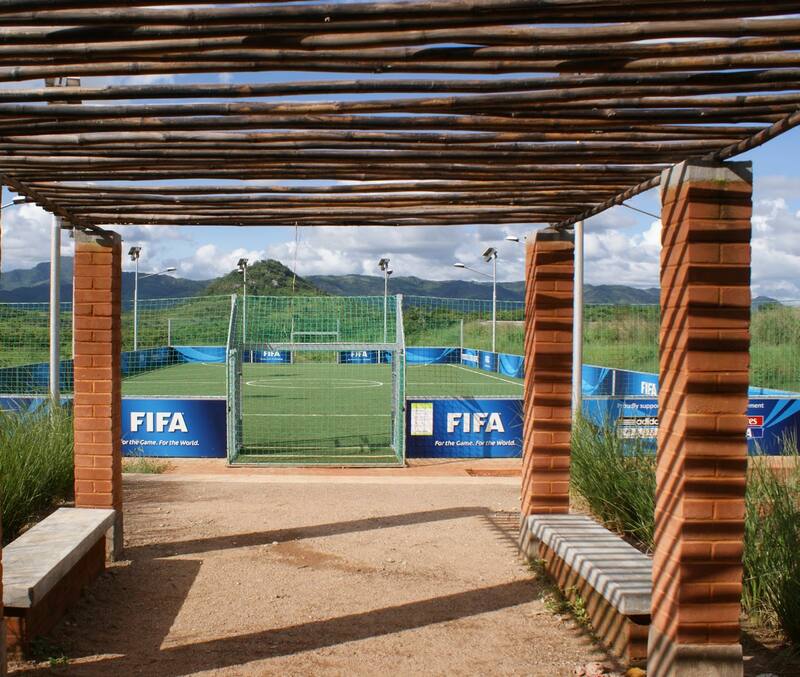 The initiative was conceived to help deliver training facilities, playing venues, and homes for local NGOs across Africa in time for the arrival of the World Cup in South Africa in 2010. But the real aim extended much further: the partners, together with international humanitarian design organization Architecture for Humanity, envisioned a network of centers that could bring social, economic, and health improvements to local communities in a sustainable manner. 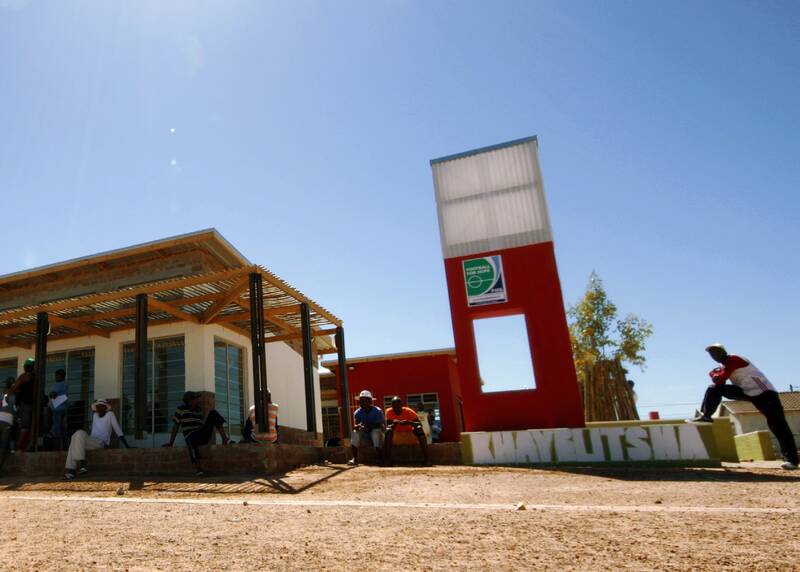 The key to success in this respect was one that runs to the heart of Architecture for Humanity’s work over the past 15 years: The centers could not be viewed in isolation as stand-alone architectural projects, but rather as vehicles for native development. The process to bring projects to life would incorporate training local people in construction, as well as teaching local communities about the real added value that good design can bring to their environment. There was also a need to respond to Africa’s complex array of social conditions and evolving demographics — who were these centers to be used by, and who was best placed to maintain and develop them going forward? In attempting to answer these questions, Architecture for Humanity’s design fellows generated a wide array of approaches across the continent, leading to a vibrant collection of public buildings. Even as they taught a large number of people about the potential of collaborative design, they also learned valuable lessons along the way. Here, we take a look at some of the key considerations that influenced the design and delivery of Football for Hope, highlighting notable examples that illustrate the multifaceted nature of football’s humanitarian set-piece. "One of the most ambitious public interest programs in the world." 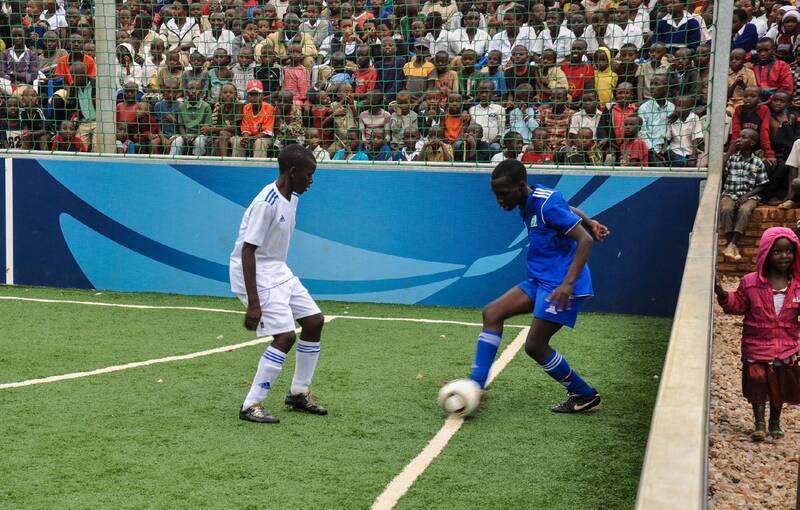 The primary goal of the FIFA/ streetfootballworld’s initiative was to create a “tangible social legacy” for communities across the continent, with facilities that could act as a hub for local people long into the future. The question was: How does one create a true “legacy” through architectural design and construction?Many of the design processes were characteristic of Architecture for Humanity’s rally against conventional “one and done”methods, which culminate in commendable but ultimately short-term solutions. 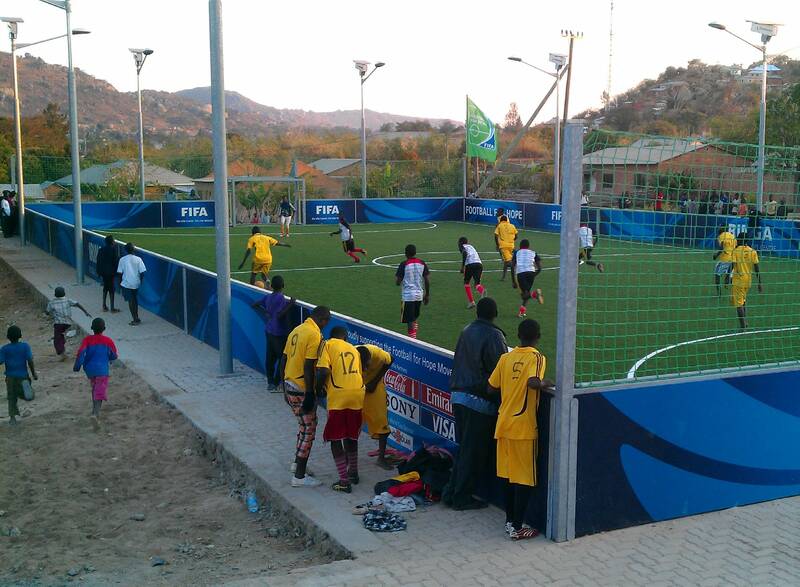 One of the program’s flagship projects, the Manica Football for Hope Center in Mozambique, is a case in point. Members of the community participated in workshops led by professionals, learning how to utilize locally sourced clay to make eco-bricks. The lively sessions culminated in the design and construction of a bread oven for neighborhood use,with participants receiving certificates upon the completion of their training. Although the bread oven is of long-term benefit to the community, the key outcome for the exercise was to demonstrate a “proof of concept” to local people. By witnessing the project’s progress, from the creation of the first brick to the completion of a useful (not to mention beautiful) structure, people quickly understood the potential of the versatile building material. The lifespan of quality construction is good, but the longevity of skills developed during this process is better. Long after the Football for Hope initiative draws to a close, there is hope that local workers will develop further projects to benefit their communities.The qualities of brick as a construction material can be described at length: high strength and durability, excellent fire and weather resistance,good thermal and sound insulation, and so on.For people unfamiliar with the material, however,it is crucial that these properties be illustrated in palpable ways to convince them of its usefulness. The bread oven formed that tangible demonstration and proved to be an effective catalyst for inspiration: the community went on to build more ovens, as well as the center’s main building, out of brick. The center itself is a standout performer within the program. The warmth of the terracotta-colored bricks, together with a simple, instantly identifiable silhouette, embodies the program’s aim to produce structures that act as local landmarks. The best examples form an architectural heart, around which the community can develop their future social and economic infrastructure. 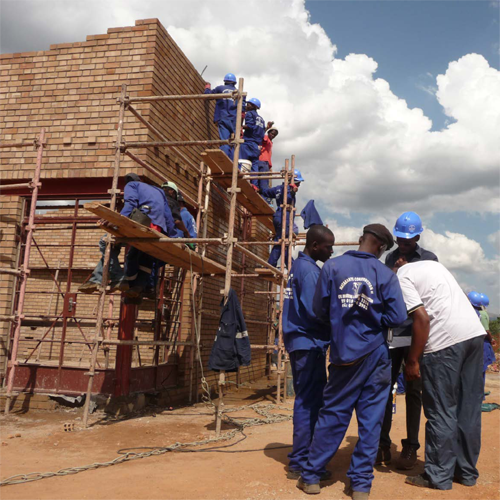 The use of local materials, like the clay of Manica — one of many sustainable features incorporated in centers across Africa — is considered essential in aiding the long-term environmental and economic viability of the projects at the post-completion stage. Multiple designs, including the center at Kimisagara in Kigali, Rwanda, feature roofs that serve as rainwater collectors are ideal for those countries that experience intense biannual wet seasons. Further, pitches were built with integrated drainage tanks, the water being utilized to flush toilets, to wash clothes, and to irrigate. Kimisagara also features a water tower, with solar panels installed to power the pumps throughout the center.Solar power was also adopted extensively for pitch floodlights, crucial in allowing local children to play during the cooler hours of the evening.Indeed, local climate dictated the design of many elements, with canopies and deep roof overhangs incorporated to shade and cool interior spaces.Materials chosen for landscape features and external finishes were selected for their availability in the local area, as well as their robust qualities: at Kimisagara, gabion-walled seating was installed pitch-side, with earth and volcanic stone being used for surrounding pathways. Intensive planting of indigenous trees was undertaken to restore the riparian edge of the adjacent watercourse. Further, trees throughout the center provide shade, soil conservation, and a green aesthetic within an urban district containing limited natural vegetation. These features were considered early in the design process, with the acknowledgment that the centers are not just for the players — spectators, families, and friends were also considered key clients for the program, increasing the prospects of the facilities being harnessed as a social hub beyond the ostensible agenda of sport and fitness. "Produce structures that act as local landmarks." The choice to adopt vernacular designs instead of employing a standard template for all 19 centers was a key decision at the outset of the program in 2010. Conventional wisdom — particularly on the part of funders concerned with economic viability of the program — dictated that standardized design could allow for prefabrication and potential savings through the volume production of components.However, to follow this simple formula would have belied the truly complex nature of delivering public buildings across this vast continent.Environmental, social, and cultural conditions of each country vary widely, and as a consequence,the design brief for each called for an idiosyncratic program and aesthetic approach.A case in point may be found in the program’s very first center, located in the World Cup’s 2010 host nation, South Africa. The chosen site was in the heart of Khayelitsha, a township within the city of Cape Town that suffers from notably high crime rates. As a consequence, local urban design guidelines specify interactive edges on every elevation that borders a public space.As a result, the design team elected to orientate the center along an adjacent high-traffic pedestrian route, thus enhancing the interaction between the community and Grassroot Soccer, the managing NGO. 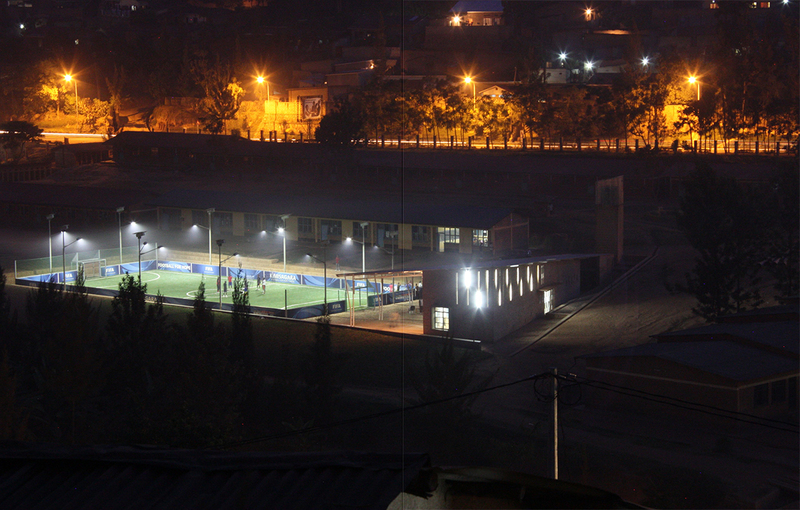 As they are located across the breadth of the continent, center designs were often driven by highly varied environmental conditions; Mogalakwena Football for Hope Center, for example, also located in South Africa, is subject to summer temperatures in the upper 90s F/30s C, with a drastically cooler climate on winter evenings. To accommodate for this, cavity walls were chosen to act as a moisture barrier and provide thermal massing, leading to a cooler internal environment in the intense summer heat. In conjunction with this, eco-insulation composed of recycled, donated paper materials was specified to curb the effects of heat loss through the roof during winter.While these designs responded to the unique nature of each site, there remained a desire to incorporate a unifying element, ensuring that the program would maintain a collective brand identity despite the huge distances between centers. This thread of common architectural language came in the form of shipping containers, painted vibrant colors and providing a dual function of signage for each center and additional storage space for football equipment.Although the centers were conceived on a caseby-case basis, communication and coordination remained essential in ensuring that the program could be delivered with a strong, unified aesthetic. Ultimately, this has provided FIFA and other funders with a compelling portfolio of images from the program that embodies their global reach,their international brands, and their wide-ranging missions. Khayelitsha Football for Hope Center. South Africa. "To raise each center above the utilitarian norm." Another key aspect of the initiative was the desire to harness contemporary design as a social driver, with the belief that increased pride in each center would incentivize the community to take good care of their facilities long into the future. With limited budgets and challenging site conditions, there were understandable doubts over the feasibility of breaking away from conventional designs when conceiving each project. 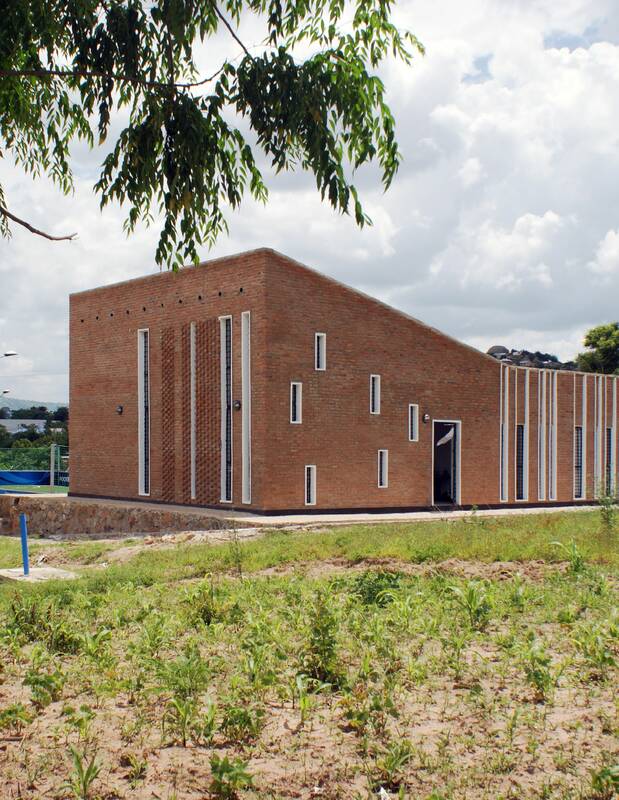 However, numerous examples among the 19 centers serve to illustrate how cutting-edge style can be maintained despite such contextual constraints.Take Tanzania’s center in the city of Iringa,for example: slender floor-to-ceiling windows are interspersed with extruded brick courses, creating a surface that is dappled with light and shade throughout the day. Beneath the mono-pitch roof toward the end of the building, the front and rear elevations are punctuated by an in-vogue, nonlinear pattern of fenestration reminiscent of modernist works by major studios such as avantgarde Japanese firm SANAA. These carefully considered details are not usually synonymous with humanitarian design due to tight financial constraints and unforgiving timeframes. 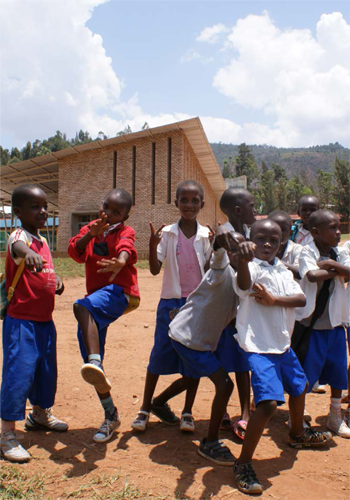 Iringa Football for Hope Center. South Africa. However, the team involved recognized the power of contemporary design to raise each center above the utilitarian norm, injecting a stylistic swagger usually associated with high-end public projects. This increases the likelihood of the center being viewed as more than just a sports facility, but also as a local landmark around which communities can gather, grow, and flourish. 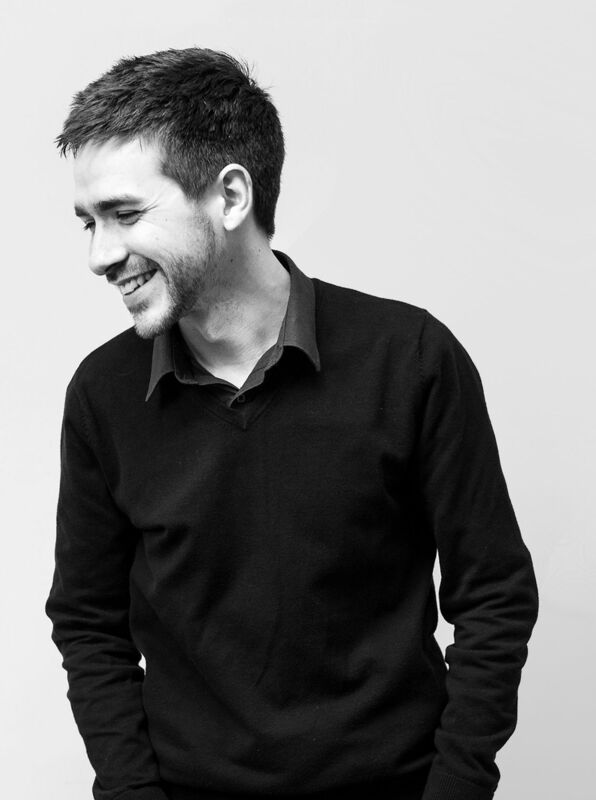 As Darren Gill, Architecture for Humanity’s regional program manager, put it in a post on the group’s blog:“Particularly in the townships ... there is an attitude that good design and good construction is just not part of the landscape, it’s not part of the culture ... So when you go into those communities and do things at those standards, people are really shocked ... they say ‘wow! Why is this happening here? That’s amazing!’ The pride, the dignity and the enthusiasm that comes from that is truly astonishing ... it offers people an anchor in the community.”The real value of such an anchor is undeniably difficult to measure, but the long-term development of the area in Iringa will surely prove to be a testament to this ambitious approach to design. The tradition of football as a tool for social cohesion within local communities has long been inherent in the sport — its accessibility and teambuilding qualities have ensured its legacy in youth culture around the globe, especially countries in Africa. However, in order for Football for Hope to achieve its overriding aim of kickstarting social change, it was vital for further programmatic drivers to be present within each project. This is why the establishment of partnerships with local NGOs was crucial to the success of the program. Architecture for Humanity, FIFA, and streetfootballworld sought to locate the centers on sites of existing organizations, already contributing to the facilitation of education, the promotion of health services, and the implementation of social integration strategies for local communities.FIFA cites two particular partnerships as exemplars within their online manifesto: its work with the Mathare Youth Sports Association (Mathare), and its collaboration with Grassroot Soccer in Zimbabwe, South Africa, and Zambia.Mathare provides leadership training and environment cleanups in the 16 most deprived areas of Nairobi, while Grassroot Soccer delivers an interactive, football-themed behavior development curriculum to empower young people;both NGOs also run extensive HIV/AIDS-awareness programs. These partnerships illustrate the increased influence that the architectural industry can have when professionals collaborate not just with clients, but also with local third parties. This tripartite chain of communication has helped to provide a solid foundation upon which local people across the continent can build, providing hubs that communities can feel both supported by and responsible for. It has been a roller-coaster ride for all involved, an inevitable fact given the context in which the program has unfolded. There have been some disappointments: The Addis Football for Hope Center in Ethiopia eventually had to be cancelled due to complications in securing the land — a sad end to a two-year journey involving great design endeavors comparable with the 19 completed centers.Ultimately though, the program can undoubtedly be seen as a huge success story in the realm of public interest design. The long-term benefits of the centers will become clearer through ongoing reviews of the facilities: not just their physical state, including the challenge of maintenance and repair, but also their effect on the wider social context of each area.Will the health of young people improve? Will crime rates drop? Can the projects act as a catalyst for further development, improving each region’s economy in the process? It will take time to discover definitive answers to these questions,but there is room for substantial optimism. The simple act of delivering completion on these projects in such challenging contexts and climates should show everyone — from funders, to NGOs,to local people — that with effective collaboration and a generous helping of determination, anything is possible.